Area between Wallasey toll plaza and Tunnel during morning peak. 1. The Mersey Tunnels are the 4th most expensive crossing in Britain. If the �and 20p coins that make up a year's tolls of � million were stacked up it would make a pile 90 miles high and weigh over 400 tons. Though someone has pointed out that the pile would fall over unless we used superglue! If the Bill goes through then the tolls for the next 25 years would be �200 million and make a stack 3,000 miles high and weigh over 14,000 tons. 2. 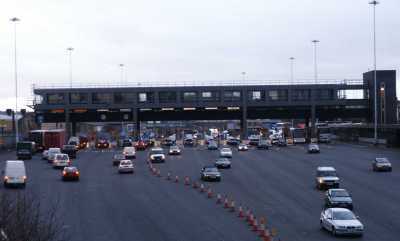 Merseyside is unique in having a toll road that is the only link between 2 parts of a conurbation. We have also had to suffer tolls for longer, the only similar older ones are Clifton Suspension bridge and Middlesborough Transporter bridge. The tolls to cross the Thames at London were removed over 100 years ago. 3. The 4 lanes of the Runcorn bridge carry more traffic than the 8 lanes of the Mersey Tunnels. The Dartford Crossing carries twice as much traffic as the Mersey Tunnels but only has the same number of lanes. 4. The Tunnels and approaches cost £44 million to build and have collected over £500 million from charges. Yet they have debts of around £100 million. 5. Someone travelling between Liverpool and Wallasey will travel along 4.2 miles of Roads (including part of the M53 Bidston viaduct) built with and maintained from Tunnel money, but only a third of this is the actual Tunnel tube. £tens of million has been charged to the Tunnels to pay for flyovers and other roadworks in Birkenhead near to the Tunnel entrance. Some of the flyovers were later demolished. 6. £58 million (when adjusted for inflation) was taken from the Tunnels to give to the Ferries between 1934 and 1976. In recent years, part of the money that the Tunnels have to pay in respect of 1988 to 1992 losses is transferred as "compensation" to the Ferries. 7. From 1951 to mid 1960s the Tunnel had to pay Profits tax:- £16 million (when adjusted for inflation). And in 1985, the accumulated Tunnels reserves of £5.5 million (£11 million adjusted for inflation) were taken by the County and used for non tunnels purposes. 8. The Tunnels are now spending a massive amount on capital works and charging it directly against Tolls. The reason given for this spending is safety. But the Eurotest 2002 report rated the Wallasey Tunnel as the safest tunnel of those tested in Britain, and the Birkenhead Tunnel was 3rd safest. 9. Road users pay £44 billion a year in taxes and only £6 billion of this is spent on roads. With 31 million vehicles, this is about �400 per vehicle in taxes and only �0 on roads spending. 10. 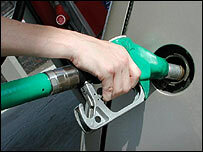 Most road users pay 60 pence tax a litre (48 pence fuel duty and 12 pence VAT). But a regular user of the Tunnels also pays about �0 a year in tolls. If only using the car for personal use, they will buy about 1,000 litres of petrol a year. THAT IS THE SAME AS ANOTHER 60 PENCE TAX PER LITRE. 11. The Parliamentary Commissioners have proposed that most of Wallasey is joined with part of Liverpool. Will it be the only constituency in England where the MP will have to pay a toll to get from one half of their constituency to the other? Or perhaps they can get a ferry if the MP has time to spare. Even better, Liverpool City Council are considering the use of European money to build a pedestrian only bridge, so the MP can better enjoy the breeze.